When we created the methodology behind TQ, we decided to focus on one of the most powerful words in the dictionary: RESULTS. 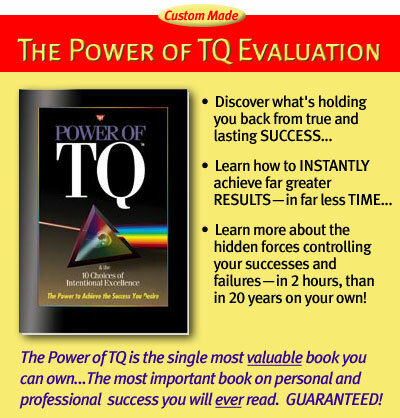 TQ stands for your Time Quotient… your ability to produce RESULTS over TIME. It is also a measurement of your Working Intelligence… the SMARTS that powers your success. When you hold yourself accountable for the Results you actually GET in the Time you HAVE, you have taken a giant step in the direction of your dreams. You are thinking like a winner — expecting to WIN and playing the game accordingly. You are now measuring YOUR progress by tangible RESULTS. The good news is this: The PAST is history. Before you is TODAY and the rest of your life. You can step up your game, Learn and Burn — becoming all that you are meant to be. You can stop all that negative thinking that torpedoes the losers, and think positive thoughts just for TODAY… just like the winners. You can choose to improve your power to produce RESULTS, and you can vow to achieve your goals. The simple truth is that it takes no more time to be RICH than BROKE. We all have been given exactly 1,440 minutes each day from which to craft everything we will ever BE, DO or HAVE in life. Successful, self-made rich people do not have MORE TIME than you. They simply make better use of their precious minutes… NEVER confusing effort with results. You will start to see imaginative new ways to make better use of YOUR time each day. Do this daily, and you will start to see better RESULTS each week. Do this for the rest of the YEAR and you will see exceptional RESULTS this year. Do this for the rest of your LIFE and you will become the success you are meant to be.